Introduction to Beadmaking - Students will learn the basics of wrapping molten glass onto a steel rod, along with several methods of glass bead decoration. Your lesson starts with a brief history of glass, the science of compatibility, working with a torch and how to safely use the equipment. This is followed with 3 hours of torch time, where you will choose your colors and began pulling stringers and twisty’s and then learn how to use them to decorate your beads. Prices include everything you need to learn the basics in beadmaking. All instruction is geared specifically for you and your comfort level and when class is over you will have made multiple glass beads all your own to take home. Intermediate Glass Beadmaking - In this class students review the basics of bead formation and will focus on making various shapes and sizes of beads. Your lesson starts with practicing techniques that focus on balance and keeping your beads round. Next you will learn how to add dots, build ups and patterns without having any sharp edges. If you feel ready, you can also try the masher and make a couple square beads! Prices include everything you will need for Intermediate beadmaking. 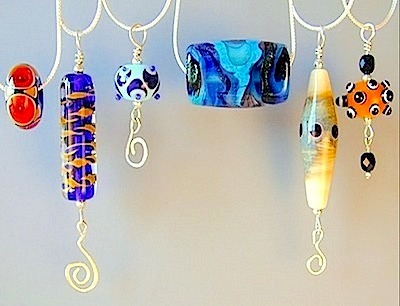 All instruction is geared specifically for you and your comfort level and when class is over you will have made multiple unique glass beads of your own to take home. Your first class always begins with a review of the equipment along with a safety lesson. 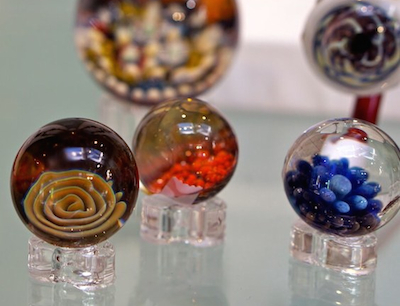 There are three categories a beginner student generally chooses from when working with borosilicate, Pendants, Sculptures, or Marbles. John likes to build his curriculum to the specific interests of each student and is happy to teach you one or all of these techniques. If you want to experience making glass art on the torch, but haven't narrowed it down to a specific interest, John has the perfect beginners class, just for you. Prices include all materials you will need for the class. Beginner through advanced students welcome, with over 18 years experience we're certain John can help you take your art to the next level. Advanced Beadmaking - Students will learn about foils and dichroic glass, hollow beads and few other unique techniques. You’re now ready for encasing, precisely placed dots, straightly laid stringers, raking, and some perfect plucking. In this class we will also work on shaping your beads into cylinders, paddle ovals, hearts and more. Prices include everything you need for the class. All instruction is geared specifically for you and your comfort level and when class is over you will have made multiple unique glass beads all your own to take home.